Darlington based, world record holding stunt rider & BikeWise favourite, Dave Coates, has recently passed his Institute of Advanced Motorists motorcycle test. Dave, who is more used to riding on one wheel ! !, doing 'wheelies and stoppies' at stunt shows all over the country, was keen to learn how to ride to 'police system' and improve his standard for riding on the road. Dave, who has performed at the annual BikeWise show every year since 1996, has always been keen to promote the fact that the stunts he perform at shows should never be attempted on roads - only at proper venues. 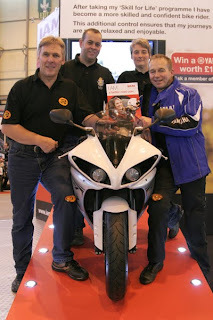 Dave is seen receiving his award from BikeWise Trainer and IAM Examiner, Bob Brown with Durham Police Motorcycle's Sgt Iain Rodgers and PC Alison Bonar at the National Motorcycle Show at Birmingham where Dave was performing.